The Navajo -- Diné in their own language -- strive to live a life of hozo – harmony and balance. Roy Kady, Navajo weaver, artist, teacher and traveler not only embodies this ideology, but also passes it on to the next generation and other interested people. He organizes workshops and apprenticeships to teach native Navajo culture. Roy's apprenticeships and teachings include many aspects of Native traditions, but sheepherding is at the heart of his approach. Last summer I was lucky enough to be able to join his group of shepherds, tasked with moving the Churro sheep up to their summer grazing lands. 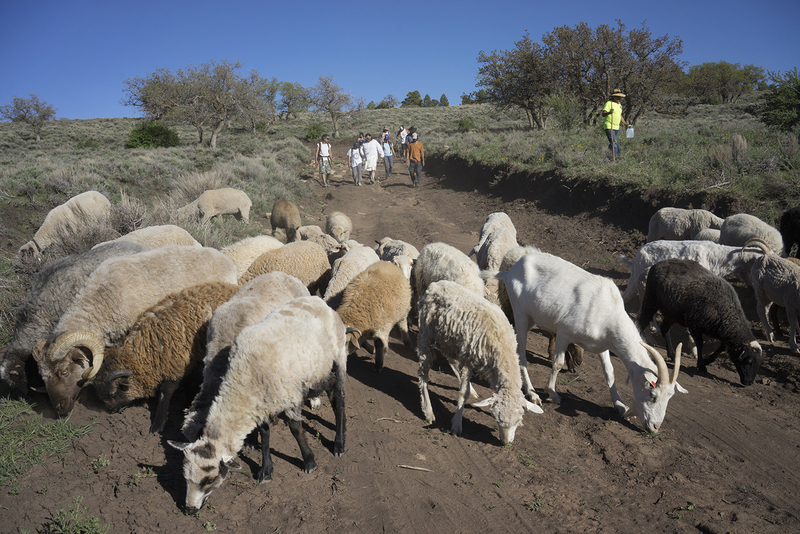 The purpose of this journey was to teach and preserve the ancestral method of sheepherding while highlighting its environmental and economic advantages. I learned that the movement of a flock on foot allows sheep and humans to adapt to the environment, which in turn sustains the ecosystem for all. Our hike took us 22 miles into the Carrizo mountain range on the Navajo Reservation in northern Arizona. Although normally this journey would be done in one day, we took two -- one evening, and all of the next day. Before we started out, we gathered in a circle to introduce ourselves and to douse our feet with a mixture of osha root and water. Apparently it repels rattlesnakes -- it has an odor that they don't like -- good information for hiking in the desert. Most of us also carried our cell phones with us -- useless as communication for most of the journey -- but put to the test as flashlights after sundown. We left late in the evening, so we ended up hiking for about an hour in the dark. 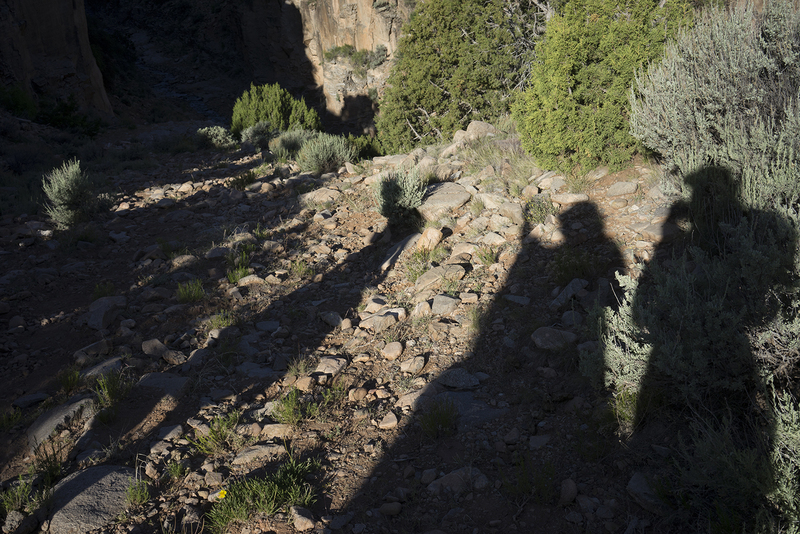 There we were, traipsing through desert sagebrush and piñon pines, along a centuries old path, following the ways of the elders with our electronic devices illuminating the way. Most of the trekkers were Roy's apprentices, friends or relatives, and are involved in the preservation of Navajo culture. One woman, Aretta Begay, works for the Navajo Lifeway [Diné bé iinà http://navajolifeway.org/] an organization, co-founded by Dr. Lyle McNeal and sheep producers. It is dedicated to restoring balance between Navajo culture, the land, and helping shepherds and fiber artists gain access to valued markets for their meat and wool products. Aretta also works with Slow Food USA, [https://www.slowfoodusa.org/ ] which supports the Navajo-Churro Heritage Lamb Presidium. This organization partners with brokers to develop relationships with chefs and others who purchase their lamb for a premium price. Aretta has traveled throughout the United States and in Europe to spread the word of how traditional shepherding preserves the environment and the economy. Roy no longer hikes along with the sheep, so he has turned the leadership baton over to Tyra. She was in charge of all the animals, and many inexperienced shepherds, guiding them through mountains and canyons, to the ancestral summer grazing grounds. She says she remembers making the journey as a very young child with her grandmother. For the 20 or so miles that it took to reach the high land, they almost never stopped. Tyra recalls how she hung onto the back of her grandmother’s skirts when she got tired, and, practically asleep, stumbled along the rocky terrain. I also met Zefren Anderson on the trek. He is an historian, a Navajo, and extremely knowledgeable about Native culture and the land. His outfit peaked my curiosity even before the trek started. He was wearing a white blanket draped around his torso, had leggings made from strips of cloth, carried a wooden staff and had a plastic water jug slung over his shoulder on a rope. 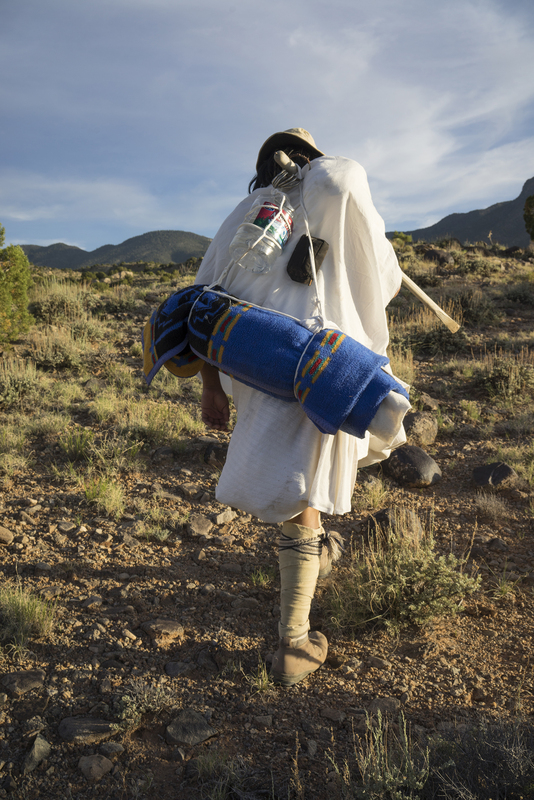 He told me that he was dressed in the conventional way of Navajo shepherds from long ago [aside from the plastic water jug, I presume]. Zefren talked a lot about the cultural and geological history of the area. According to him, the sagebrush and piñon are invasive plants. They have been choking out the natural trees over the last several decades. In fact, the name of the town Teec Nos Pos, where we started our journey, means "circle of trees." Apparently many trees once grew in a circle at this site. Now they are mostly gone. [Zefren's assessment of invasive plants is widely supported. According to Cornell University's College of Agriculture and Life Sciences, non-native weeds have invaded at least 40 percent of America’s croplands, pasturelands and public lands. And they keep spreading, causing $50 billion annually in environmental and agricultural damage.] At one point during the hike he called out, to whoever would listen, "And what happened in 1070?" Well, the sunset crater erupted. Ten feet of ash covered the area. It displaced the people. This was not the first, nor the last time the Navajo would have to adjust their lives. Another amazing Navajo I met on the trek, was Kody Dayish. He is an award-wining filmmaker who uses an all-Native cast, and works with his younger brother, Kolin Dayish. His first film, a short called The Beginning, won the "Emerging First Time Director Award" at the 13th Red Nation Film Festival in 2016. Now he is working on a full-length film called The Red Hogaan, based on a true story. It follows the tale of a Navajo family targeted by a Skinwalker in the 1990s. He has his own film company, Kody Dayish Productions, [https://www.facebook.com/DAYISHHH/] his own Navajo/Indie band, Our Last Chants, and, he is also is an actor. He will co-star in a new film called Desert, to be filmed in Northern AZ this fall. During our long hike, as we grew weary, hungry or thirsty, Tyra suggested that we look behind to see how far we had come. It gave us a sense of accomplishment and helped us to push on. After a total of about 10 hours of hiking, we all made it up to the summer grazing grounds. There, a small, dirt-floor shepherd's hut sat perched atop a mesa with stunning views of the canyon below. The next morning we all gathered to witness a Navajo prayer ritual led by Roy and fellow trekker, Deon Ben. 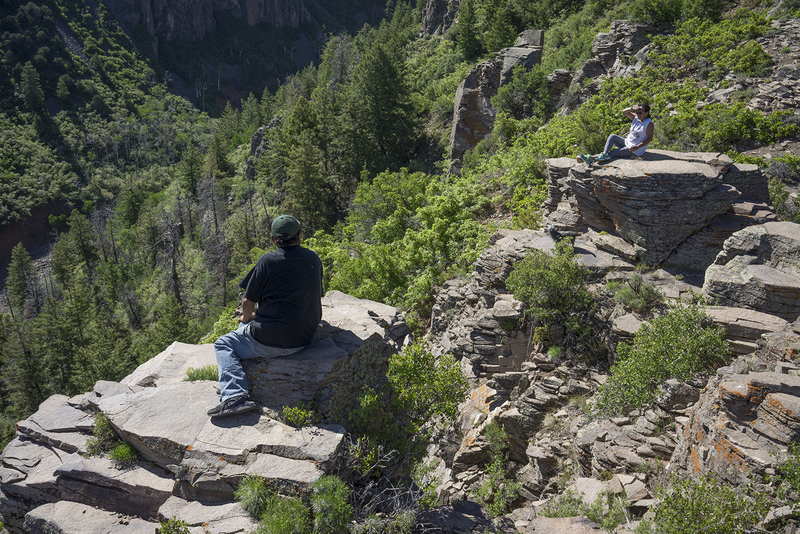 Deon works as a Native American Program Associate with the Grand Canyon Trust. Before praying, the Navajo choose a tree as a communicator to the spirits and place an offering, something valuable like turquoise, by the tree. They have a specific format for their prayers. First, they appeal to Mother Earth, for without her we would have no home. Next, they pray for the animals. After that, they acknowledge people they do not know, then their own family, and lastly, themselves. These prayers come full circle, bringing the earth back to hozo.